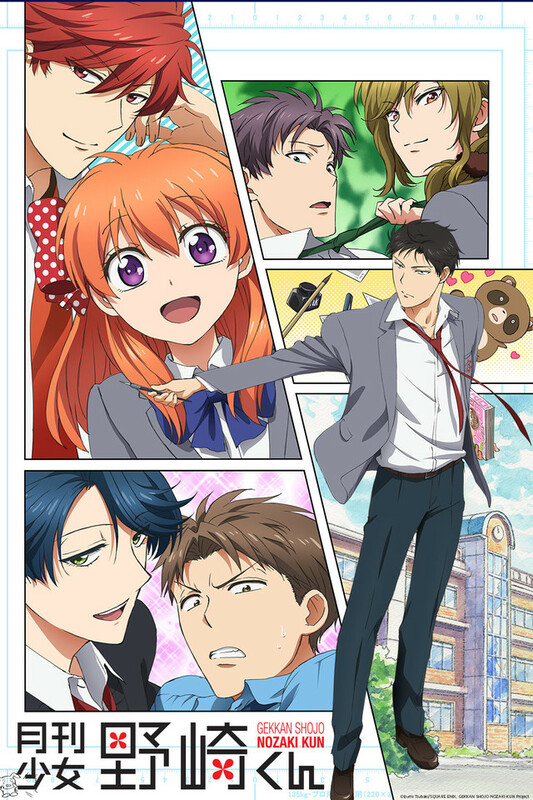 The basic premise of Monthly Girls' Nozaki-kun is everyone's super oblivious to everything - and for a series that focuses on a guy writing a shojo manga - it's perfect. It never tries to take itself too seriously, and because of that it's one of my absolute favourite comedies. I just wish there was a second season, but until then, it looks like I'll just have to keep re-watching! I believe this is my frist review on this site and I'm glad it's for this anime. When I watched this anime I didn't know what to expect, I thought it'd just be your stereo-typical Shoujo anime and oh, I was absolutely wrong. From scenes that are normally predictable being unpredictable, from moments that truly show the bonds and uniqueness of the characters, to the over all hilariousness. If you're ever feeling depressed and need something to smack you right out of it, well this would be the perfect for you. I Marathon this anime, I regret it so much. Why? It's not the anime I regret if anything I want more! What I regret was the extreme amount of pain in my throat from laughing too hard. I nearly lost my voice and at one point started to choke. This anime nearly took me down however I survived! I absolutely love this comedy. I had constant tears in my eyes. Even when thinking back on it I have a smile on my face. I'm not sure if my writing skills for this type of thing are up to par with how the format for it is however, I think even with my painful experience I'm overly glad I watched this anime. I absolutely love this anime. OMG! DUDE, YOU NEED TO WATCH THIS! Want a shojo that makes fun of shojo, or at least pokes fun and teases. This show is hilarious. How could anyone hate it? If you don't find it funny, then no point in forcing yourself to watch the rest. Just watch something else. I've watched it twice and I will absolutely watch it again. I have watched Monthly Girls' Nozaki-kun twice and I have plans to watch it again in the future. I love this anime and the OVAs; I'm sure that no matter how many times I watch it I will find it just as hilarious as the first time watching. It would have been great if it had gotten a second season, but since it didn't I started reading the manga and it's just as enjoyable. This awesome anime should definitely be given a watch. Also, something that I have learnt from this anime is that a new way to reject someone is to give them your autograph. This should be a fun method for both parties involved. #158. Anime of a manga of a shoujo mangaka. Chiyo Sakura has fallen head over heels for a tall and incredibly obvious boy named Umetarou Nozaki, upon confessing to him, he responds by handing her a autograph. Turns out the stoic boy is actually a popular and respected shoujo mangaka, and he mistook her confession as a desire for a autograph, couple more misunderstandings later and Chiyo is now assisting Nozaki-kun in creating his manga. Chiyo never really confessed her feelings properly. Or more accurately Nozaki-kun is just that oblivious, moron… I adore Chiyo and am sad by her unrequited love. Regardless, it still is a top tier comedy. Honestly one of my favorites. Very funny and never fails to make me laugh hard. It has great animation, voice acting, and music really does make it seem like a perfect adaptation, minus the fact that some stuff is left out from the manga. Really wanting a season 2, but that most likely won't happen. Also if you didn't know there are some OVAs which are worth watching. It's a good anime. The characters are all interesting in their own ways, and aren't carbon copies of each other. It's definitely got its funny moments, I rewound more than once because it made me laugh so much. I'd have liked to have given it a 3.5 stars, but there's no half star rating. However, it doesn't really go anywhere. Every episode is pretty much the same, and there's little to no character growth. I was mostly bored by episode 8. It's not a bad anime. It's good, but not great. Weirdly enough, this show had me laughing the whole way. I'm not the most dedicated anime watcher around, sticking mostly to mainstream (Naruto, My Hero Academia, etc.) but giving this a chance, it was a cute and funny show that definitely deserves another season. No overt action scenes or tense fight scenes. If you choose to watch this show you're in for a comedy and a tad bit of drama. You'll enjoy it! If you're looking for a good slice of life comedy, this show is perfect. The characters are tropes that are spun on their head and this also has a hopelessly dense guy character that you don't fault him for his mistakes. I hope this anime gets a second season at some point because I would love to see what happens with these characters. At first this just pleasant to watch, and enjoying the humor as context established in the universe. By episode 8 I was in tears rolling with laughter. Whatever time I might have felt wasted during buildup phase had payoff well worth it. After seeing the same reiterations of anime characters over and over and over, everyone's design was refreshing, bubbly, and almost gender bender. While the series never went above and beyond to break boundaries, it was funny, unforced, and I never felt checklisted or pandered to. Perfect as is.